All girls love fall. It’s a fact. The apple picking, the cozy sweaters, playing with the corpses of dead leaves…there’s just something in our DNA that makes us go crazy for fall. I don’t know about you, but now that we are in the middle of fall, I just want to cook and bake even more than I usually do. I’ll just be playing on the floor with my daughter and suddenly get an odd twinge in my left big toe that tells me it’s time to go into the kitchen and whip up something that tastes like fall. One of my favorite comedians is Iliza Schlesinger. I love her because her comedy is just so incredibly smart and relatable. 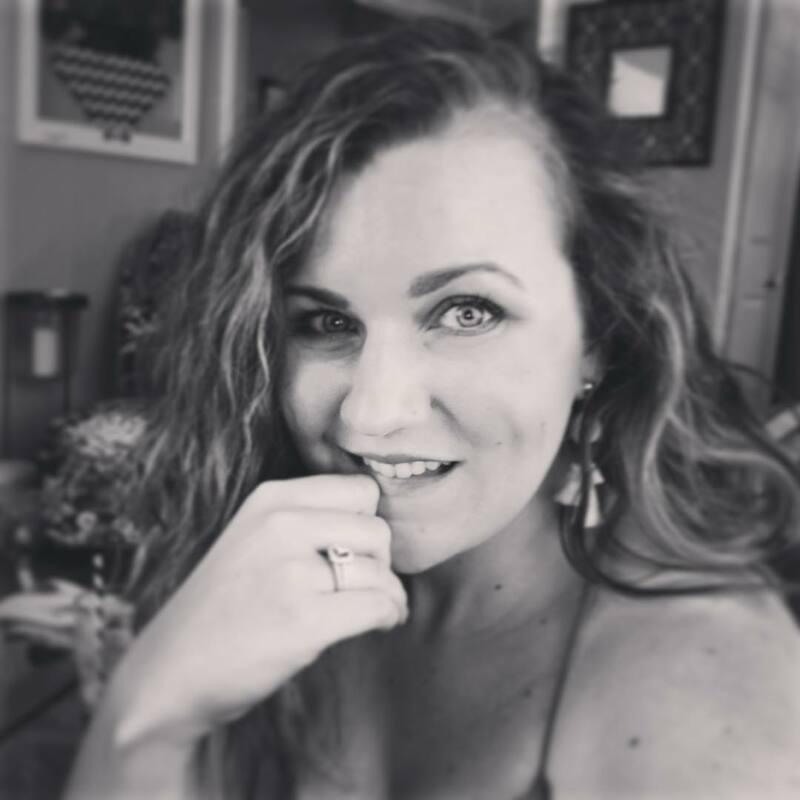 Every joke and story she tells is something you’ve done, seen or thought of doing. She just speaks the truth (in many voices) when it comes to being a woman and really just being a human in general. Plus, her dog Blanche is the most merciful little lamb you’ll ever see. I’ve seen her perform live four times and watched her Netflix specials more times than I care to admit—to the point that my friends and I quote her often in our daily lives. One of my all-time favorite bits of hers is from her second Netflix special—Freezing Hot. It’s about how all girls love fall to the point that we start planning for fall in July and when fall finally arrives we go out of our way to find any excuse to eat PUMPKIN EVERYTHING!!! Needless to say, that’s how this recipe was born. 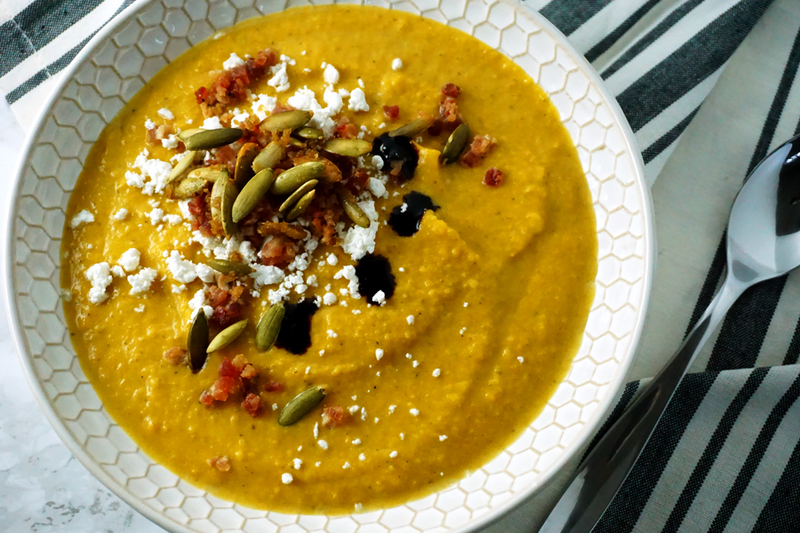 The temperature dropped, the leaves fell and I had the sudden urge to create a soup that combined all of fall’s best flavors and would hopefully earn me my official “girl card”, as Iliza would say. 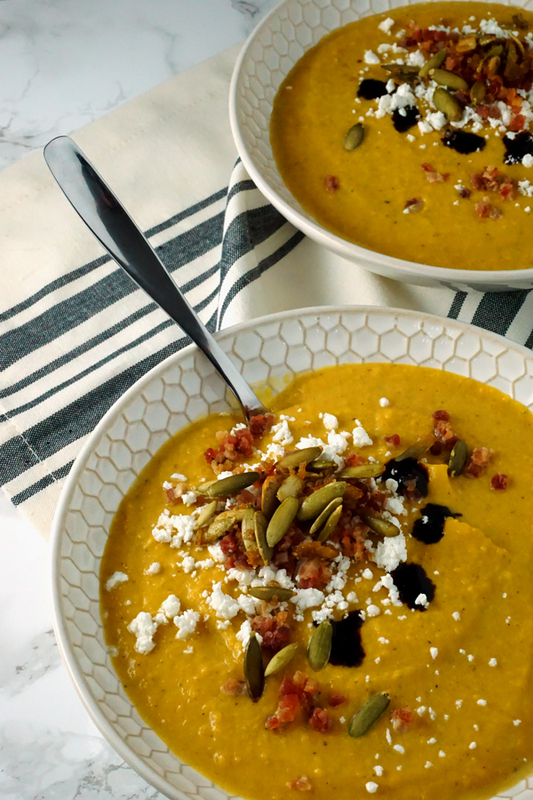 This soup has it all; sweet apples, salty pancetta and tangy goat cheese surrounded by a luscious puree of pumpkin, butternut squash, ginger, nutmeg and herbs. 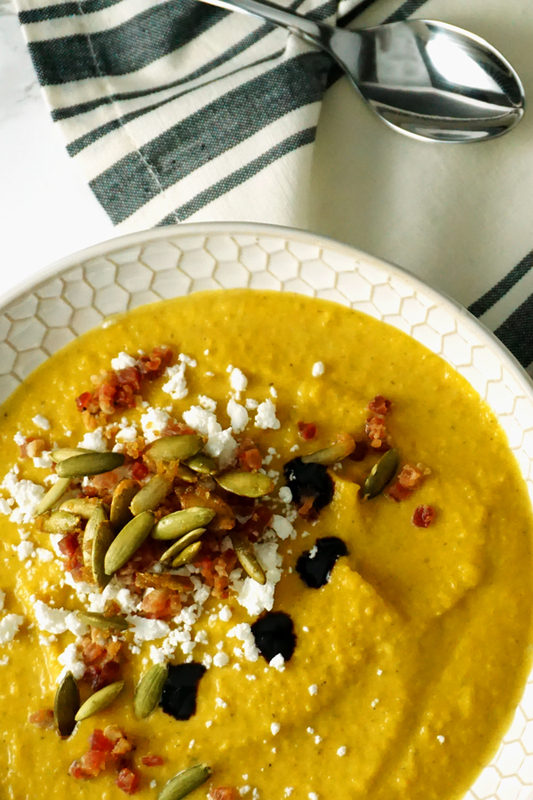 You can pack away your obsessive collection of fall-scented Bath and Body Works candles while you make this soup because it will fill your house with the scent of fall as it bubbles away on your stove top. It all starts by roasting the butternut squash in the oven with a bit of thyme and olive oil while you begin to sauté the apples, onions, garlic and fresh sage on the stovetop. As it starts to come together pumpkin puree, spices, and chicken broth gets added along with heavy cream before it all gets pureed together until smooth and velvety. The real magic happens at the end however when each bowl is topped with crispy pancetta, roasted pumpkin seeds, goat cheese and the smallest droplets of balsamic reduction. Delicious!!! 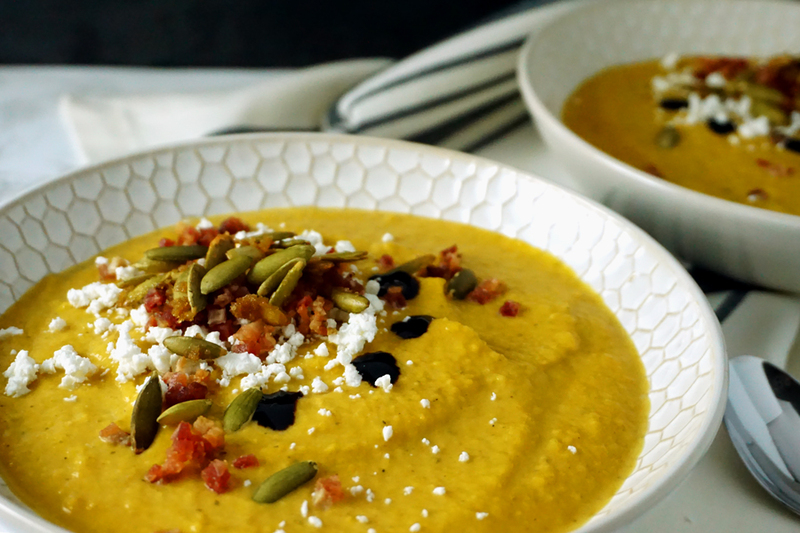 Now, I know it’s already after Thanksgiving and a lot of you have already moved on and are ready for Christmas, but hold onto your pumpkin spice lattes with your grubby little (party) goblin claws for a little longer so you can try this soup. What about you? Do you love fall? Have you watched Iliza’s comedy before? Let me know below in the comments. Also, if you do try out this recipe, don’t forget to tag me on Instagram (@frydaeblog or #frydae). I love to see what you guys are whipping up in your kitchens and hearing your thoughts. 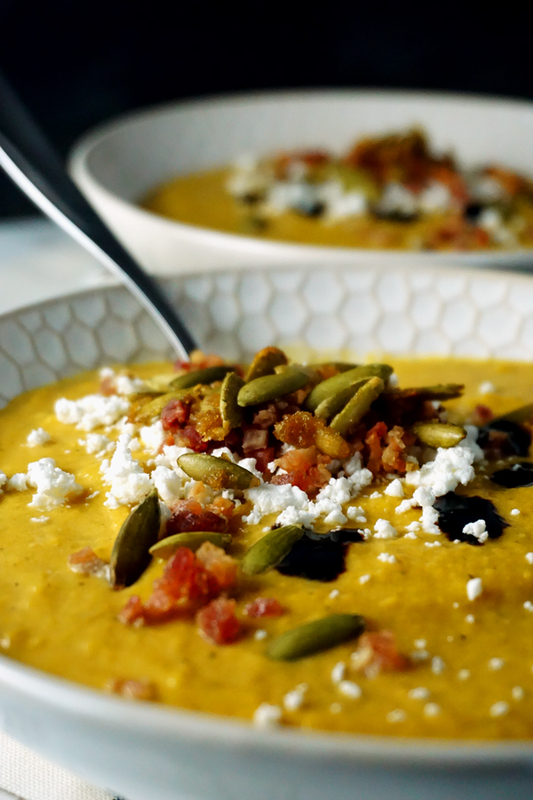 Pureed roasted butternut squash, apples, onions and herbs come together in this luscious soup that gets topped with creamy goat cheese crumbles, toasted pumpkin seeds, crispy pancetta and rich balsamic glaze. Preheat oven to 400 degrees Fahrenheit. Then, prepare the butternut squash by cutting in half and removing the seeds. Next, cut into slices and trim away the skin before dicing into 1-inch cubes (or just use fresh pre-cut squash). Place squash onto a large roasting pan and drizzle with 1 tablespoon of olive oil and sprinkle with dried thyme. Place into preheated oven and roast for 20-25 minutes, or until squash is tender and edges have started turning golden. Remove from oven, set aside. Meanwhile, in a skillet over medium heat, cook pancetta (or diced bacon) until crispy. Remove from pan and let drain on a paper towel lined plate. Set aside. Next, in a large stockpot over medium heat, drizzle 1 tablespoon of olive oil and begin to saute diced onion and garlic. Cook 4-5 minutes, or until onions have become translucent and garlic is fragrant. Now, add the diced apples, fresh sage, nutmeg and ginger. Cook until apples have softened and onions have begun to caramelize—about 5 minutes. Then, add 1 can of pumpkin, maple syrup, and roasted butternut squash. stir until combined and then add 4 cups of chicken or vegetable stock. Bring to a simmer and let cook for 20-30 minutes to let the flavors meld together. 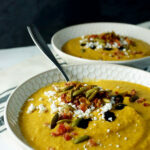 After 20 minutes, remove soup from heat and using an immersion blender puree until soup is smooth. If you don't have an immersion blender, you can also carefully transfer the soup, using a ladle, into a blender or food processor and puree until smooth. Once soup is pureed, return to low heat and stir in 1 cup of heavy cream. Let simmer for a few more minutes and then spoon into bowls. 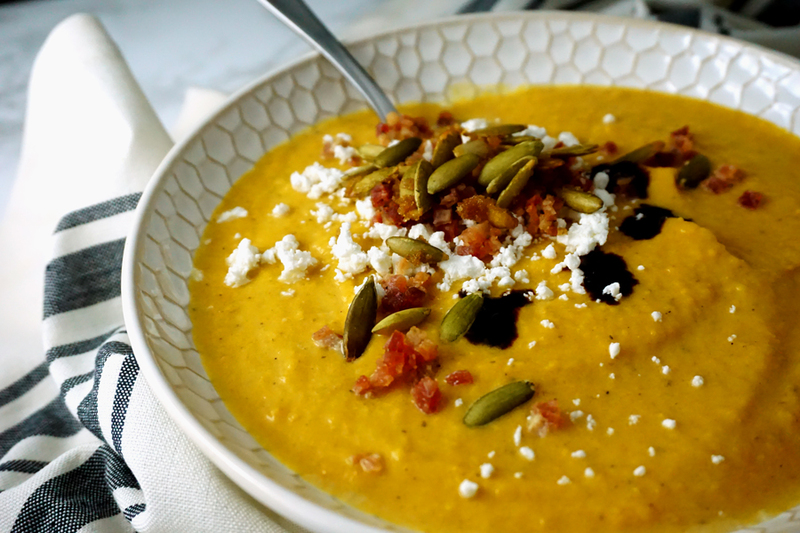 Garnish each bowl of soup with cooked pancetta, goat cheese crumbles, roasted pumpkin seeds, and a few small drops (3-4) of Trader Joe's balsamic glaze.